Many of the people who know me have heard me refer to “Letter night,” which happens every month or two and to which I always look forward. The premise is this: We cook our way through the alphabet. So for example, for the letter A, everyone brought a dish that began with the letter A. It was always a surprise to see what we ended up with and how different they could be. As I recall, I first joined this tradition around the letter “I”, and it took about another 5 years to make it through the rest of the alphabet. I think we’ve all enjoyed these nights, and so when we got to Z, we decided to start again – with a twist. This time, the host (as determined by alphabetical order, of course), decides what ingredient we all work with, ala Iron Chef/Chopped. For A night, Amy decided on Artichokes. And this past weekend, Colleen decided on, of all things, Bologna. 100 blogs. Wow. Totally thought I would have quit blogging by now. Oops. Probably shouldn’t have admitted that. Sideshow Act: She Can Sing! She Can Act! Keeping Perspective: Flight, Fright or Fight? I’ve been having fun with it so far – have you? And to make this post not entirely all about me – tell me which topics you like best and which topics you’d like to me to tackle more often. I’ll see you again at 200. When I was growing up in LA, I loved basketball so much that my dream in life was to be Chick Hearn. 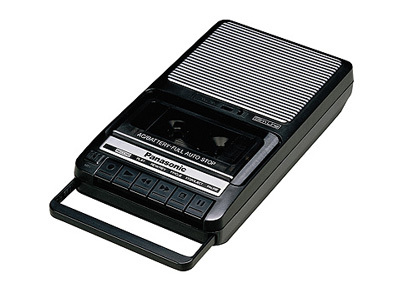 I used to use a tape recorder similar to this one. (Even then, you can tell that my athletic ability was non-existent, since I was dreaming of being an announcer, not a player.) Somewhere in the bowels of my mom’s house are hidden a few audio tapes of a 12-year-old girl vainly attempting to provide the play-by-play for a Lakers game. I used to watch the game, turn down the sound and use an old tape recorder to practice. I got it! I finally got it! A load bag of crap! What, you don’t know what I’m talking about? I take it you’re not familiar with woot.com?